One of the greatest spectacles of migration is a swirling flock of Broad-winged Hawks on their way to South America. Also known as “kettles,” flocks can contain thousands of circling birds that evoke a vast cauldron being stirred with an invisible spoon. 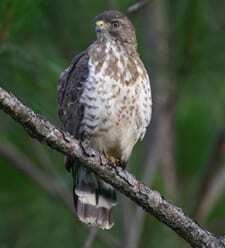 A small, stocky raptor with black-and-white bands on the tail, the Broad-winged Hawk is a bird of the forest interior and can be hard to see during the nesting season. Its call is a piercing, two-parted whistle.